For a number of years, scientists were trying real hard to study various ways of implementing miniature robots for treating a variety of diseases. These miniature robots are planned to enter the body of a human being and deliver rugs to specified locations as per necessity. These robots would also possess the capability of carrying out intricate operations like clearing up clogged arteries. 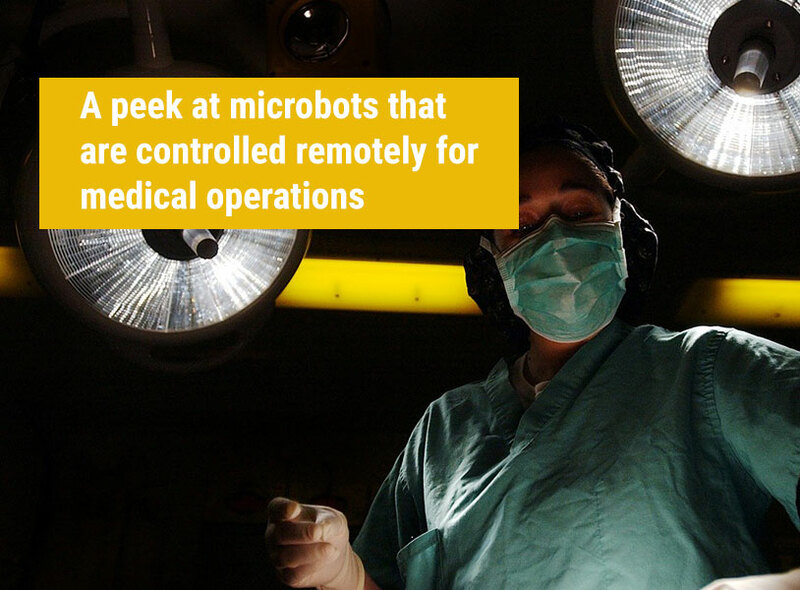 By performing such complicated operations, these robots can bring a revolutionary change in the field of medicine. EPFL scientist Selman Sakar along with Bradley Nelson and Hen-Wei Huang developed this simple yet, versatile method to build such bio-inspired robots. They also equipped them with advanced features referred to in the later part of this article. The team created a testing platform for testing a number of robot designs and studying various methods based on locomotion in relation to the bot. The entire work is published on Natural Communications. The microbot is said to look and move like a bacterium. These robots are unique in a certain way because these microbots are quite soft, flexible as well as motor-less unlike conventional robots. These microbots are made of biocompatible hydrogel as well as magnetic nanoparticles. These nanoparticles serve to be of two functions. They give the bots shapes during the production process. They can also make the bots move as well as swim when they come in contact with an electromagnetic field. Several steps are involved in manufacturing these microbots. The nanoparticles are firstly placed into a bio-compatible hydrogel. An electromagnetic field’s applied for orienting the nanoparticles at various parts of the bot, followed by polymerization for solidifying the hydrogel. The robot is then placed in water where it can fold in a specific pattern that’s dependent on the orientation of the inclusive nanoparticles in the gel. This last step results in forming the overall 3-dimensional architecture of the microbot. Once the robot acquires its final shape, the robot can swim under the application of an electromagnetic field. The application of heat brings in a change. When the robot’s heated, the microbot change its shape and unfolds itself. Such a type of fabrication approach permits the researchers to manufacture microbots that can mimic the bacterium primarily responsible for causing sleeping sickness. This specific bacterium utilizes a flagellum for the propulsion but it can also hide the same away when it’s inside a person’s bloodstream as its survival mechanism. This short video below can explain this content to a certain extent. Different designs of microbots are tested by the researchers and the design mentioned above is seemingly the best among the lot to imitate the behavior of the bacterium. The prototype bot developed by the researchers (shown in the video up above) possesses a flagellum that enables the bot to swim. When it’s heated with the help of a laser, the flagellum gets “hidden” by wrapping itself around the body of the robot. Sakar’s statement can throw ample light on this matter. Without further ado let’s get to that. "We show that both a bacterium's body and its flagellum play an important role in its movement," said Sakar. "Our new production method lets us test an array of shapes and combinations to obtain the best motion capability for a given task. Our research also provides valuable insight into how bacteria move inside the human body and adapt to changes in their microenvironment." For now, the microbots are still in the stage of development. But there’s no denying this fact that this is a revolutionary idea. At the same time, researchers must ensure that these microbots do not cause any sort of side-effect in patients. After all, they are getting into the intricate human body and perform a specific job. There are high chances of things going wrong. Hence, precautionary measures must be taken. Researchers must consider all these cases individually where these microbots can perform a job and wreck havoc at the same time; and take necessary measures for the same. Only after that, this project will be regarded successful by people and will be accepted whole-heartedly by the society.